Crispy and delicate, e dal sapore dolce e delicato, the Chestnut of Cuneo has undergone a revival over the past 30 years, that led to the acknowledgement of a Protected Geographical Indication in 2007. The Chestnut of Cuneo PGI grows in the mountains and valleys of the province of Cuneo. Mentions of chestnut farming in the Cuneo area can be found in writings dating to the 12th century. Chestnuts were a staple for agricultural labourers over the centuries, who would dry and consume them in their entirety or grind them into flour, as witnessed by the many drying facilities still extant throughout the territory. The substantial depopulation of the countryside in the 1950s lead to a decline in production of chestnuts, which, however, was revived in the 1980s. The process led to the acknowledgement of a Protected Geographical Indication in 2007, which involves 110 municipalities. The Chestnut of Cuneo PGI is a fruit of average size. The standards clearly does not allow any damage exceeding 10%. To be labelled PGI, the chestnut must have a hard, shiny skin, whose colour must range from pale to dark brown. The edible pellicle underneath must be crisp, with a colour ranging from yellow to pale brown. The seed to which the pellicle adheres is white and has a sweet, delicate flavour. The Chestnut of Cuneo PGI is rich in starch and a good source of fibre, potassium and B group vitamins. When cooked, the starch turns into simple sugars, which provide the distinctive sweetness. 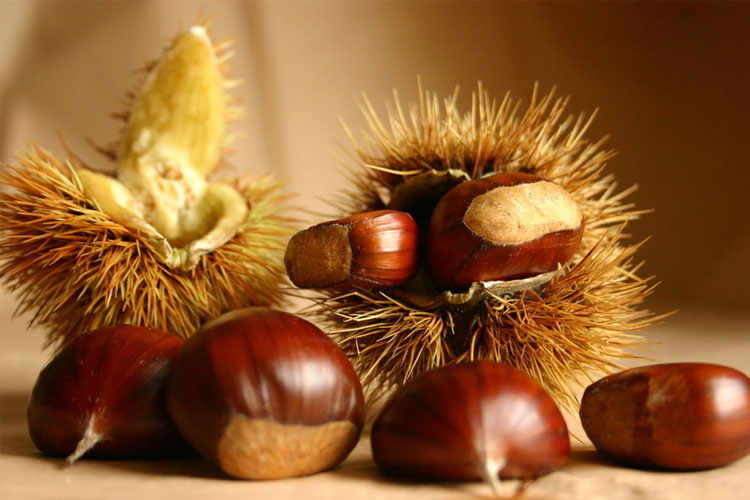 The Chestnut of Cuneo PGI is generally harvested from late September to early November. 1kg corresponds to roughly 110 fruits. Once harvested, the chestnut are either consumed fresh or left to dry in permanent structures, called secou. In addition to the traditional caldarroste (roasted chestnuts), the Chestnut of Cuneo can be used in a multitude of recipes. Boiled and ground, they can serve as a base for gnocchi and focaccia bread, or as a stuffing for ravioli and capons. The sweetness of the Chestnut of Cuneo PGI makes it a perfect ingredient for desserts like the typical castagnaccio, a plain chestnut flour cake, and the Cuneo-Style budino di castagne, a chestnut pudding. From the hors d’œuvre to the dessert, the chestnut can be paired with semi-sparkling wines like Barbera and Bonarda.